Each knife of this type uses the Saddlehorn structure -- 4-7/8-in. folded length with a heavy rear bolster and stronger clip and spey blades than in the smaller Trapper style. Some models feature two clip point blades instead of the spey and clip pair. David Yellowhorse, a famous Navajo jeweler and custom knife maker, added his own designs to bolsters and handle grips. Detailed nickel silver inlays and engraved designs portray important symbols of Native America. The most expensive design, called Eagle Feather, uses a combination of black jet and orange spiny oyster shell inlaid with an eagle and eagle feather in sculpted nickel silver. At the other end of the scale, the Antique Bone Grizzly Saddlehorn knife uses handle slabs of black and yellow antiqued bone, engraved with the outline of a grizzly bear. 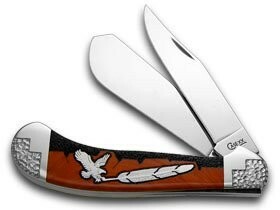 Only two of the Eagle Feather knives were created, but the more affordable Antique Bone Grizzly belongs to a longer run of 500. The Yellowhorse Saddlehorn knives include several small 25-knife limited editions with unusual blades -- some of hand-hammered steel in the classic Case patterns, and others custom-made by David Yellowhorse from his own select high carbon steel. Many collectors will find the knives to be good investments, but all the Yellowhorse knives are in short supply. Try the SOG Tomcat Knife for a collectible in a truly modern design.